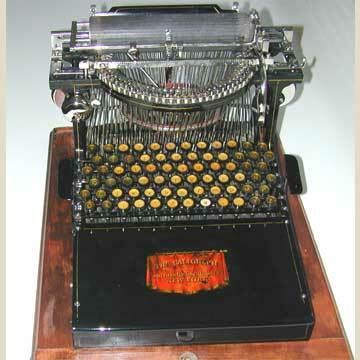 The Caligraph 2 was the first typewriter on the market with a full keyboard. Each character had its own key and its own type bar that was independently suspended from the edge of the type basket. With 72 keys, against 48 on the caps only Caligraph 1, the Caligraph 2 was considerably wider than its predecessor. Technically, the Caligraph 2 was virtually the same as the Caligraph 1. It just had more letters and it was larger. The stretched front seems to have been designed to provide a lighter touch. The type levers on the Caligraph were fixed at the front end of the machine, so by placing the keys in the center of the wooden type levers the force needed to strike them was about the same as with the Remington, on which the levers were fixed to the end of the machine. The awkward front gave ample space for a very ornate decal that has often worn off, because the front was also a natural arm rest. Picture 4 shows the vertical rod leading from the centrally located main spring, that ran the full length under the center of the machine, to the carriage. This construction needed great tension on the spring itself to provide enough momentum to actually move the carriage, making the spring one of the weak points in the design of this charming machine. Also note the faceted platen. When the Caligraph was introduced, the type used for typewriters was still standard, flat printer's type, that was not adapted to print on a round surface like a platen. On a round platen only the center of each letter would be printed. The faceted platen, with a whole series of narrow flat surfaces around the core, the flat printer's type worked perfectly. One problem that Georg W.N. Yost, the big man behind the Caligraph, didn't master on this machine was alignment. The individually suspended type bars were held down with screws and could very easily be turned around. Adjusting them must have been a lot of work, but also a continuing problem once the machine was in use. It was this problem that Yost decided to solve on the next machine he produced and that was to carry his name: the Yost typewriter.